In addition to the money-related business responsibilities of closing a law practice discussed in the previous two articles (click to see Part I and Part II), there are other business responsibilities, too, including various notifications. The next article will discuss a few final business responsibilities. Find out if your state requires you to place a public notice of the intent to close your business. If so, put the how and when of the procedure on your timeline. Speak with the utility companies well in advance of your closing to ensure that service will be turned off as required and not earlier. The services that will be most affected and that you deal with directly are your phone and Internet service providers, so speak with them as well to make sure that their requirements are factored into your timeline. Think about having your office phone number transferred to a voice mailbox so that clients and others can leave you messages that you can return. If possible, keep this voice mail service for at least a year. Prepare a list of all of the vendors and suppliers that serve your practice, including subscription services such as West, LexisNexis, and others. As the closing date draws closer, notify them of your intent to terminate any ongoing relationships. File forwarding instructions with the post office to make sure that any mail addressed to your office will find you at home or wherever else you designate. Because forwarding orders are only good for six months, remember to mark your calendar to renew the forwarding order for an additional six months. If, on the other hand, you have a P.O. box in use, plan to keep it for an additional period, perhaps a year after the office closes. 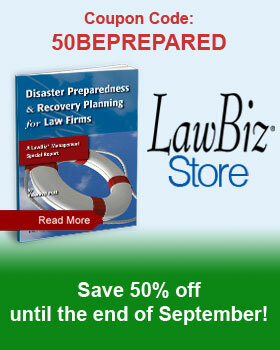 If you need assistance planning your exit strategy from your law firm, contact a legal coach today at 310-827-5415.